Braveland Heroes is a turn-based strategy game from Tortuga Team. Set off on a dangerous quest in the search of the royal relic. Destroy your enemies in online duels and uncover the secret of the king’s scepter. 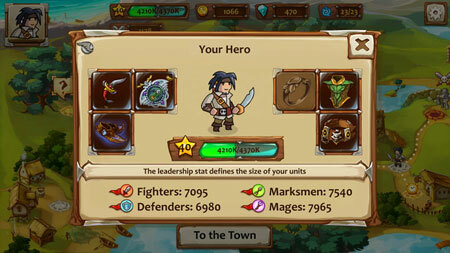 Use tactics to lead legions of heroes, fight the bosses and conquer other players. Your army will be joined by various kinds of allies – archers, monks, demons, beasts, knights, and many others. Your journey begins in an ancient forest; you will pass through the southern lands and over the high mountains, you will encounter orcs, ghosts and mysterious nomads. In the north you will fight with might and main in the age of Vikings wars, rush into the clash of thieves and assassins, and try to bear the palm in fights of fiends and pirates. If you get stuck in the game, check out the video walkthrough and gameplay for the game. This entry was posted in PC Games, Walkthrough and tagged Braveland Heroes Cheats, Braveland Heroes Gameplay, Braveland Heroes Guide, Braveland Heroes Strategy, Braveland Heroes Walkthrough by Marvin. Bookmark the permalink.